Dr. Anne Comi received her medical degree at the SUNY Buffalo School of Medicine, then completed a residency in pediatrics at Children’s Hospital of Buffalo and a pediatric neurology residency at Johns Hopkins Hospital. Currently, she is an Assistant Professor in Neurology and Pediatrics at the Kennedy Krieger Institute and Johns Hopkins Medicine. She began her clinical and research interest in Sturge-Weber syndrome during her Pediatric Neurology residency and research training. 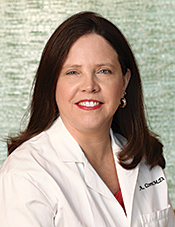 She now directs the Johns Hopkins and Kennedy Krieger Institute Sturge-Weber Syndrome Center. Her clinical expertise is in the diagnosis and treatment of the neurologic aspects of Sturge-Weber Syndrome. Her research focuses on studying the pathologic processes involved in the neurologic complications of Sturge-Weber Syndrome, as well as the impact of impaired blood flow in the brain. Through both clinical and basic research, she hopes to develop new approaches to preventing neurologic deterioration resulting from impaired brain blood flow in Sturge-Weber syndrome.